Take the water where you want it with the AQUA JOE heavy-duty garden hose. The 1/2-inch flow, kink-resistant 100' hose features durable zinc fittings for secure, leak-proof connections plus a protective bend-restrictor sleeve for uninterrupted flow. Constructed of rugged, kink- resistant high-grade PVC for maximum durability and performance. Lead-free, phthalate-free and BPA-free. Perfect for watering the flowers, washing the car, rinsing patio furniture or connecting to a lawn sprinkler. The HDX garden Hose is perfect for any light-duty watering chores. It is flexible and lightweight, making it easy to handle. THE STAINLESS STEEL HOSE THAT'S AS TOUGH AS NAILS! AQUA JOE's lightweight stainless steel hose is quite simply the last hose you'll ever need! Made from high-quality industrial grade 304 stainless steel for a lifetime of reliable use in your yard and garden.Won't cut, crush or crack - won't split, kink or get hot in the sun. It's the one hose that works as hard as you do. A rugged, virtually indestructible and puncture-proof stainless steel outer sheath surrounds a flexible PVC inner core, for maximum performance and durability, and features bend restrictor collars and durable aluminum fittings at each end for unrestricted water flow and secure, leak-proof connections.Lead-free, phthalate-free and BPA-free. 1/2-inch x 100 ft. Heavy-Duty Garden Hose Take the water where you want it with the AQUA JOE heavy-duty garden hose. 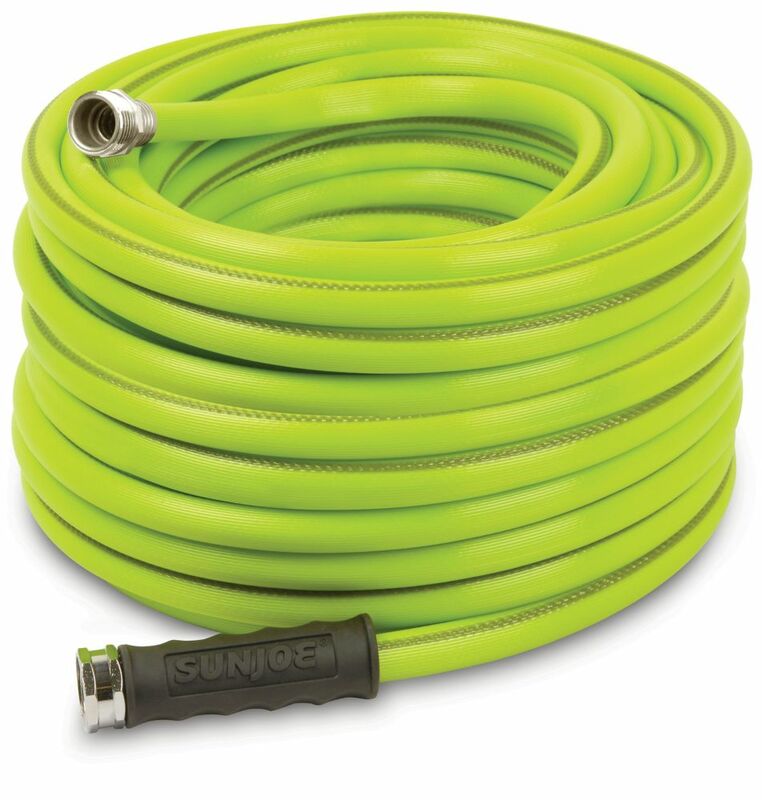 The 1/2-inch flow, kink-resistant 100' hose features durable zinc fittings for secure, leak-proof connections plus a protective bend-restrictor sleeve for uninterrupted flow. Constructed of rugged, kink- resistant high-grade PVC for maximum durability and performance. Lead-free, phthalate-free and BPA-free. Perfect for watering the flowers, washing the car, rinsing patio furniture or connecting to a lawn sprinkler. 1/2-inch x 100 ft. Heavy-Duty Garden Hose is rated 4.0 out of 5 by 53. Rated 3 out of 5 by Lisa from The hose leaks at the faucet connection. It also is... The hose leaks at the faucet connection. It also is not kink free. Rated 2 out of 5 by JoeV from Not that great It is light weight but has a lot of kinks when I use it. Rated 1 out of 5 by QualityisKing from Hose connector breaks away from valve connector after a few weeks. I bought 4 hoses and all four... Hose connector breaks away from valve connector after a few weeks. I bought 4 hoses and all four have failed. Sun/Snow Joe customer service is as good as these hoses. They do not and will not stand behind their product. They will not replace them even though I registered the products on their website. Save your money and apply it elsewhere towards a hose made of better quality from a better company. Hoses also kink all of the time causing very poor water flow as they do not unkink without human intervention at the kink point. Rated 4 out of 5 by Ingrid from Love it! very light weight. Happy with my purchase for... Love it! very light weight. Happy with my purchase for sure. Might buy a second one. Rated 5 out of 5 by Nate from So far it is one of the best hoses I have ever purchased. So far it is one of the best hoses I have ever purchased. Rated 4 out of 5 by Peter from Have it ~3 weeks, so far does the job. It... Have it ~3 weeks, so far does the job. It is light indeed and hope will serve through the years as it is promised.